TREC consists of 3 phases; Orienteering, Control of Paces and PTV. The sport was invented in France 30 years ago and is designed to equip horse and rider with the skills to successfully and safely plan and ride a route in unfamiliar terrain. It’s a sport relying on the rider’s skill, rather than their courage or how expensive their horse is. The first phase is the orienteering, which ranges from 12 to 45 km in length, depending on level (level 3 orienteering is up to 32 km long, which usually takes about 6-7 hours to ride), and is done at a range of set speeds. Judging is done both with respect to accuracy of route and accuracy of time keeping, with an equal number of penalties being deducted for being too fast as too slow. Levels 3 and 4 can include navigating by grid references or bearings alone. The 2 other phases are called Control of Paces and PTV. Control of Paces involves cantering as slowly as possible down a 150m corridor and then walking back as quickly as possible. Scores are then based on the time taken for each part. The last phase is the PTV, which is sometimes called the Obstacle Course. This is a course of obstacles designed to be examples of what may be met on a ride in the countryside, each of which is marked out of 10 as to how well the horse and rider tackle it. 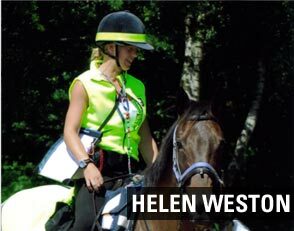 Obstacles can include riding through water, jumping small jumps, riding or leading up or down slopes or steps and opening and closing a gate. This is also done against the clock, with points being deducted for being over the time limit.